Purrder She Wrote is second in the pawsitively charming new feline mystery series set off the New England coast, where curiosity leads to some killer small-town secrets…. It’s the grand opening of Daybreak Island’s cat café, where customers can get cozy with an assortment of friendly felines―and maybe even take one or a few home. Co-owner Maddie James is purring with excitement over her new warm-and-fuzzy venture. . .until she becomes entangled in a petty drama between one of her volunteers, an ardent animal-rights activist, and a wealthy woman who insists on adopting a calico kitty―right this instant. The catfight that ensues is bad enough for business. But when the snubbed socialite is found dead with a tell-tale catnip toy on the scene, suspicion lands squarely on Maddie’s staffer. Now, with her reputation and her career prospects on the line (to say nothing of her budding romance with a handsome pet groomer) Maddie must do whatever it takes to solve the crime―before her nine lives are up. 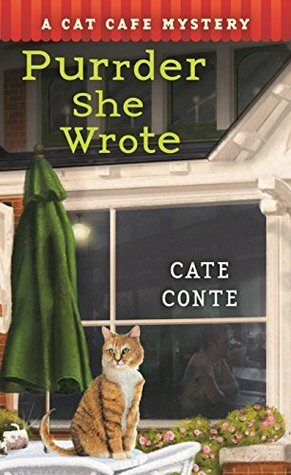 Purrder She Wrote by Cate Conte is the second book in the cozy Cat Cafe Mystery series. In this series Maddie James had returned home to Daybreak Island, just off the coast of Massachusetts, to attend her grandmother’s funeral and got caught up in her grandfather’s troubles. She hadn’t planned on staying with her own business across the states but when a solution of opening a cat cafe in her grandfather’s place came to her Maddie was all in. Now with the cafe opening Maddie is glad she is back with her family and running another successful business, her business partner had even joined her to help get things up and going. Things start off pretty busy for the new cat cafe when one of Maddie’s volunteers happens to get into it with a wealthy patron. To make matters worse after leaving the lady sends to the local police to investigate. After everything is calmed down and the police are satisfied it was just a mutual disagreement with no need for the law Maddie forgets all about the incident. That is until she and her grandfather get yet another visit from the law, this time with the news that the very same patron had been murdered the night before. With Maddie’s staff in question she can’t let the crime stay unsolved for long so she begins to look into the matter herself. Again the Cat Cafe Mystery series had all of those cozy elements you would hope to find in this genre, likable characters, frisky felines, and a murder to solve. Maddie again has her hands full with plenty of suspects as she tries to clear another person she knows. In the first book I warned it had the makings of a love triangle going on but that seems to be fizzling out and the hopes on one love interest although the “romance” is barely touched on in favor of the crime solving. And of course again I’ll look forward to seeing where the series goes next. Cate Conte serves on the Sisters in Crime New England board and is a member of Sister in Crime National, Mystery writers of America, and the Cat Writers’ Association. She currently lives in Connecticut with her cats and dog. Cate is the author of the Cat Cafe Mystery series. Such a cute title! Great review! This sounds so adorable, Carrie! I think I would love this series! Wonderful review! Yeah, don’t mind a bit of romance in a cozy but we don’t need multiple love interests. Another great review Carrie, another series I need to get to. You always make them sound so appealing.